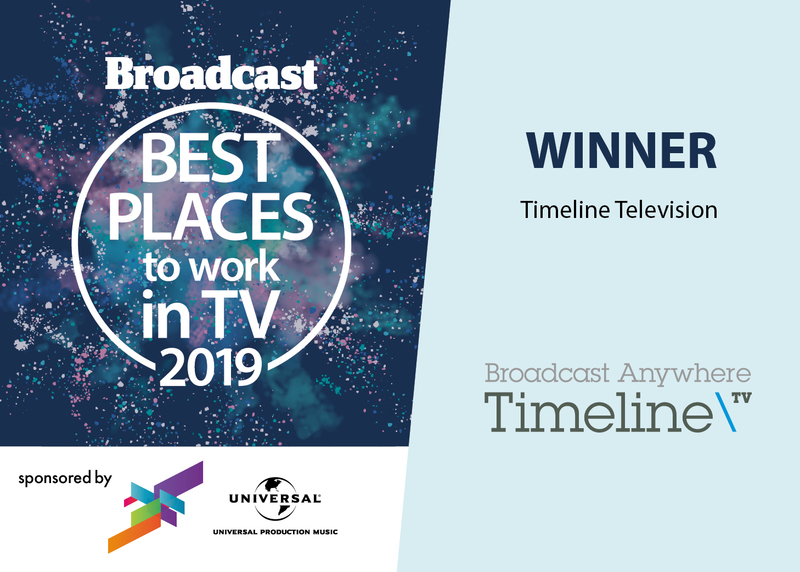 Timeline named one of Broadcast's Best Places to Work in TV 2019 - Timeline Television Ltd.
We are incredibly proud to have been recognised as one of Broadcast’s Best Places to Work in TV. The list of the Best Places to Work in TV was created by Broadcast and Best Companies Group. This survey and award program was designed to identify, recognise and honour the best places of employment in TV, benefiting the TV field, its work force and businesses. Organisations from across the UK entered the two-part survey process to determine the Best Places to Work in TV. The first part consisted of evaluating each nominated company’s workplace policies, practices, philosophy, systems and demographics. The second part consisted of an employee survey to measure the employee experience. The combined scores determined the top organisations and the final ranking. Best Companies Group managed the overall registration, survey and analysis process and determined the final rankings. For more information on the Broadcast Best Companies to Work for in TV programme, visit www.BroadcastBestPlacestoWorkinTV.co.uk.